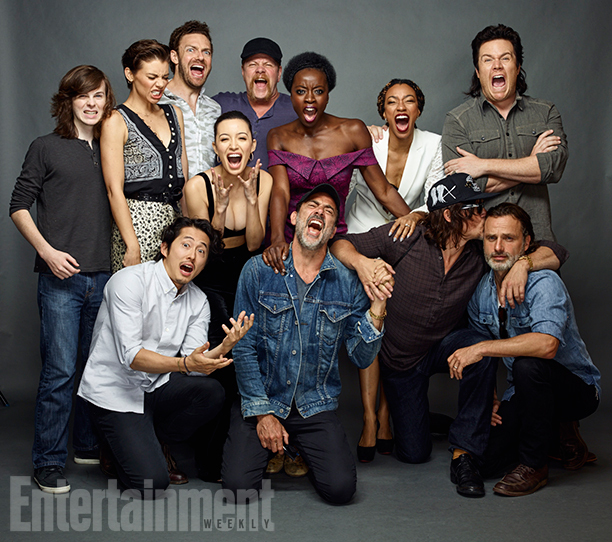 The Walking Dead Cast @ Comic-Con 2016. Chandler Riggs, Steven Yeun, Lauren Cohan, Ross Marquand, Christian Serratos, Michael Cudlitz, Jeffrey Dean Morgan, Danai Gurira, Sonequa Martin-Green, Norman Reedus, Josh McDermitt, and Andrew lincoln. Wallpaper and background images in the The Walking Dead club tagged: photo the walking dead cast. This The Walking Dead photo might contain bridesmaid, msichana wa heshima, mjakazi wa heshima, wamevaa vizuri mtu, suti, suruali nyayo, pantsuit, mtu wamevaa vizuri, and suti ya suruali.